Welcome to the home of Data Realms' first independently developed game, Cortex Command! It features real-time tactical battles, and also a strategic, turn-based metagame on top, with support for up to four players in split-screen. 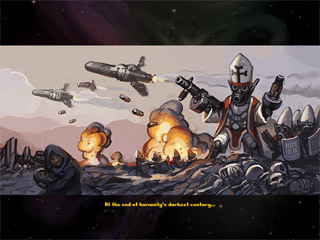 It won two awards in the Independent Games Festival 2009. 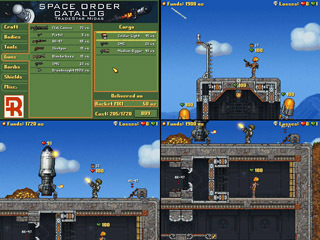 Dynamic 2D pixel graphics coupled with an extremely detailed physics engine makes for replayable and emergent gameplay. Scroll down for more information about the concept, story, and features of this labor of love! Game Trailer - use the 720p and fullscreen button! Playing as one of these people's brains, you can quickly switch control between many different expendable bodies in order to complete otherwise dangerous tasks - all from the physical safety of your command bunker. Use these technological powers of telepathy to collect gold out of the fully destructible terrain, then purchase even more bodies and materiel with those newly acquired funds! Cortex Command is set a few hundred years into the future, where the now cybernetic human race is able to travel between stars and has already met several alien civilizations. Interstellar trade and prosperity reigns, but there is always an ever-expanding frontier to explore and exploit for precious resources. In this gold rush of galactic proportions, fantastic adventure and brutal competition awaits. You play as the boss of a small gold mining company that has just arrived at a newly discovered Earth-like planet. The large space ship that brought you here along with many other adventurers is called a TradeStar. It acts as a massive orbital safe haven and marketplace for the fortune seekers who venture down onto the planet's surface. Your purchases of bodies, guns, and equipment are sent from the TradeStar orbiting above and delivered to you by your choice of landing craft. Fully destructible environments - The gold you need to excavate is sprinkled throughout the terrain of each scene. Use special digging tools to blast your way into the dirt and debris. All the pieces of bodies and ships from your struggles will fall to the ground and permanently add to the battlefield. Get more powerful (and expensive) diggers and you can even tunnel into your enemies' bunkers from below! 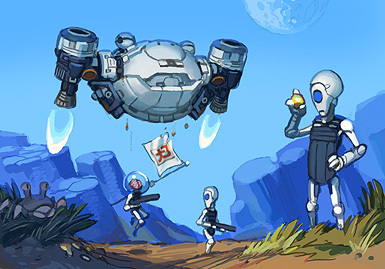 In-game buying menu - At any time and place during the game, bring up a powerful menu to order new bodies and equipment, all delivered at the location and by the transport ship of your choosing. Rockets are cheaper but unreliable and harder to land. Drop ships are far more expensive but can quickly deploy entire groups of puppets onto difficult terrain. Ships and equipment returned to the TradeStar are refunded to your account. Build your own bunker - At the start of most missions, you are able to take your time and build your own command bunker from scratch. Easily design twisting tunnels and place doors, traps, and turrets to thwart your enemies' intrusions! Pre-deploy and equip bodies in and around your installation to prepare yourself for your objectives. Don't spend too much though, or you won't have enough funds left when the mission starts! Four-player cooperative and/or versus multiplayer - Gather your friends and plug in those game controllers! Play skirmish or campaign missions with or against up to three of your buddies. 2 vs 2, 1 vs. 3, 4 vs. the CPU - it's up to you! (rhyme intended). Flexible control settings allow you to use the keyboard, keyboard + mouse, or any generic game controller you can find and plug in. Built-in editors and modding - Several in-game editors allow you to easily create your own stuff. The game's engine is built to make it very simple to modify and add your own content. Design your own missions, guys, ships, weapons, tools, bombs, and shields - and easily share them with your friends. Join and download some fantastic mods from the community at the Data Realms Fan Forums. Cortex Command is still being improved! Please note that Cortex Command is a work in progress! The campaign mode and missions are fully playable, if not in a completely polished state yet. However, you may buy a license today, which will give you access to all future improved versions. Oh, and they're all DRM-free so there's never any hassle with installing on as many computers as you like. Enjoy!